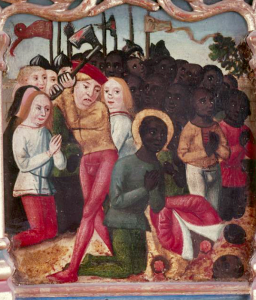 What happened to the Black European? Germany (c. 1500) Oil on Wood, 66 cm. Brühl, Katholische Pfarrkirche St. Margaretha. The black European bleached out by mixing with pale Slav and Goth immigrants from Central Asia. Many white European are not really white they are bleach out black people. Black and mulato European became a strong minority (40%) in Europe after the large migration of pale central Asian to Europe in the 6 cent CE. Pale Central Asian became 60% of the population. The first European were the black Khoisan called Grimaldi that migrated to Europe 50,000 years ago. The Greek were black and brown people.. The Roman were black and brown people. Europe until the late colonial era of the 18 cent CE was ruled by black and brown monarchs, nobilities, clergies, intellectuals and bankers. The white masses uprising in the French revolution (as well as numerous unreported genocides) and the degradation of black in the African slave trade forced the black nobilities of Europe and the black European masse to mixed with the white European in order to bleach out.. Many dark skin European live in South Spain, South Italy, Romania and Bulgaria. making it easy for the newcomers to lay siege upon the weak remaining kingdoms. The same happened in the east giving rise to the mongrel peoples of the Middle East. Blacks were supplanted and the falsifying of Europe had begun. Intriging. I wonder about the slave raids on european coastal towns and what caused them. Less of a racial problem with black and brown leaders in Europe than attacks by north african based pirates. With a lot of black native americans and irish indentured slaves treated brutally I think that americans tried to attack thr slave trading ports. This is not completely true, many black Europeans were brought over to the Americas, enslaved after the end of the Jacobite wars. Why is nobody here talking about this? Realhistory has plenty of articles on this. Because people don’t read. The Jacobites (Yacubites) don’t want us to know that we once populated the Earth. Very interesting history. I am a newbie, and I want to study true history. How can I get access to these sources and books on true history, especially European history? Why cant the black community create our own stories, video games and comic books based on true history, instead of feeding on fantasy history forced on us by the dominant society. It is essential for Black people in particular to refer to black authors on the subject of African world history. We can no longer accept the interpretation of our history by our oppressor no matter who they are. No Jewish person would accept the interpretation of his history from a Nazi. So read our story from our historians to get an accurate and reliable account. The Caucasion race is not indigenous to any land on the face of the planet earth in Europe and Greece. Here’s a few prominent people in European history.